Make Mozilla Thunderbird show you emails in plain text for easier reading and better security. Who does not appreciate the colors and figures and golden anointments found in any baroque church in Europe? You can get lost in so much detail, and another angel or painting is always a mere glance away. You can read in such a church for days and months. To everything, its place and time, though. Do you want to read a single email for hours? Do you appreciate colors in it, variations in size that stun and another graphic around every sentence's turn? Or would you prefer your emails to be clean instead, like a modernist interior, nothing but text of equal size and styling, easy to read and fast to digest? Would you prefer not to be entirely at the sender's whim for that? In Mozilla Thunderbird, you can choose not to be: the email program can display all emails in plain text—as much as possible, of course. Emails using baroque HTML formatting are not a priori evil. Potentially, though, each formatted message is a risk to your security and privacy. Plain text is always more secure, because it is limited to a very small set of characters, and it knows no commands that the email program would execute. If you set up Mozilla Thunderbird to show emails in plain text, you also make your email more secure. Select View | Message Body As | Plain Text from the menu. If you do not see a menu bar, hold down the Alt key. You can also click the Thunderbird Menu (hamburger menu) button in the toolbar. Note that Mozilla Thunderbird will not convert messages that come only in a formatted version to plain text. It will display the plain text alternative only for emails that come in the multipart/alternative format, which includes both a rich-text and a plain text version of the same message. 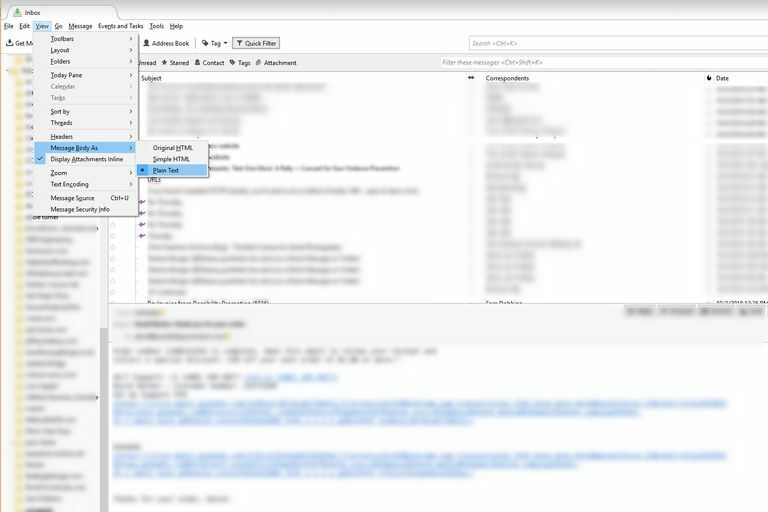 With plain text display enabled in Mozilla Thunderbird, messages that contain only formatted text will be shown blank. Select View | Message Source from the menu to see the full email source. The message source will contain HTML code and may be difficult to read. You can have Mozilla Thunderbird render the HTML in a simple—more secure—manner. Select View | Message Body As | Simple HTML from the menu. For security's sake, make sure remote images are disabled by default: select Tools | Options from the menu, go to the Privacy tab and make sure Allow remote content in messages is not checked. If you prefer to read (and receive) messages in plain text, you may want to return the favor and send your emails using only plain text as well.